They made a gluten free protein bar that delivers no soya, wheat, sugar alcohols or hydrogenated fats taste good. So good that the brand has released 29 different flavours, ranging from Chocolate Brownie to White Chocolate Raspberry. To help you navigate these diverse creations, we put together a flavour guide detailing every Quest bar ever created. Ingredients: Protein Blend (Milk Protein Isolate, Whey Protein Isolate), Soluble Corn Fiber (Prebiotic Fiber), Almonds, Water, Natural Flavour, Erythritol, Palm Oil, Sea Salt, Sucralose. Vanilla Almond Crunch is delicate balance between pleasantly sweet and overly sugary, which is what makes this product a staple for many. Loyal vanilla fans claim that it is the perfect blend of quality taste and nutrition! The Quest Vanilla Almond Crunch bars embody that midpoint. Vanilla Almond Crunch is for people with a refined palate and love for almonds. This particular flavour is ideal for those who enjoy a simple tasting supplement. Consuming one of Quest’s Vanilla Almond Crunch will keep your body’s protein intake high so that you feel less hungry. This will lead to less caloric intake and more muscle growth. Ingredients: Protein Blend (Milk Protein Isolate, Whey Protein Isolate), Soluble Corn Fiber (Prebiotic Fiber), Peanuts, Water, Almonds, Natural Flavours, Erythritol, Palm Oil, Sea Salt, Calcium Carbonate, Sucralose, Steviol Glycosides (Stevia). Peanut butter is chock full of protein. Couple its natural protein with Quest’s recipe, and you are sure supply every cell in your body with the necessary protein for substantial muscle growth. Quest has discovered that when put into a supplement bar, peanut butter not only supplies the ideal taste to nut lovers, it also sets the stage for the ideal balance of energy. If you are a fan of peanut butter, you’ll love this. They have carefully kept the flavour in balance and made it better than even most peanut butter brands. Quest Peanut Butter bars fill your taste buds with the taste of nuts and all the nutritional benefits that come along with eating nuts. It’s a treat for all nuts-lovers. Ingredients: Protein Blend (Milk Protein Isolate, Whey Protein Isolate), Soluble Corn Fiber (Prebiotic Fiber), Almonds, Water, Apples, Natural Flavours, Erythritol, Palm Oil, Sea Salt, Cinnamon, Calcium Carbonate, Sucralose, Malic Acid. Apple Pie is Quest’s quest to provide its health conscious customers with a protein bar which provides the fresh, energizing and natural taste of apple with the nutritious value of naturally occurring top-quality proteins. The bars leave a taste in your mouth much like the one you get by consuming apple juice before an exhausting match. The only thing is, Quest has added a slight tinge of cinnamon to its apple flavour, so the bar comes out with a slightly piquant taste to add to the natural taste of apple pie. The end product tastes like cinnamon added to apple juice, but more protein-rich than even milk or cheese. It’s a combination which fails to please no one. A universal favourite indeed! Ingredients: Protein Blend (Milk Protein Isolate, Whey Protein Isolate), Soluble Corn Fiber (Prebiotic Fiber), Almonds, Cocoa (Processed with Alkali), Water, Natural Flavours, Palm Oil, Sea Salt, Calcium Carbonate, Sucralose, Steviol Glycosides (Stevia). Delicious is certainly a term that come to mind at the sound of the word chocolate. You just need to say chocolate to some, and a rush of sugar and a bad day are in their future. But, with Quest’s Chocolate Brownie bar, chocolate means a protein supplement sure to fuel every cell in your body. And that’s what you get if you bake the Quest Bar in a microwave for 15 seconds. The only difference is, it’s not glutted with unnecessary carbohydrates. It won’t make you fat. Put simply, it’s the taste of a chocolate brownie minus the only bad thing about it. It is rich of all-healthful proteins. The Quest chocolate bars are actually the most pleasurable way to turn yourself into a fit, muscular person. Ingredients: Protein Blend (Milk Protein Isolate, Whey Protein Isolate), Soluble Corn Fiber (Prebiotic Fiber), Peanuts, Water, Erythritol, Cocoa (Processed with Alkali), Natural Flavours, Palm Oil, Sea Salt, Steviol Glycosides (Stevia). Chocolate coupled with the taste of peanuts has put many candy companies on the map. Quest’s Chocolate Peanut Butter bar has certainly followed in toe. Made to supply your body with the additional protein necessary to build lean muscle and to help maintain a healthy weight, the Chocolate Peanut Butter bar ranks among the best in the Quest bar line of products. Quest bars taste much the same as the big box candy bars, but again, without the only side-effect--carbohydrates. And you can do all this without even gaining even a pound of weight or risking the health of your teeth. It’s nothing but the highest-standard natural proteins which will bring your body in the ideal shape. Ingredients: Protein Blend (Milk Protein Isolate, Whey Protein Isolate), Soluble Corn Fiber (Prebiotic Fiber), Almonds, Water, Erythritol, Natural Flavours, Dried Strawberries, Palm Oil, Sea Salt, Steviol Glycosides (Stevia). This flavour is for the people who like things a bit fresh and new. You can have it after a meal or an exercise. Its sweet, dessert-like taste will satisfy you on all occasions. The taste of cheesecake serves as a perfect background like that of a desert. Almonds add to the delight of both the strawberry and the cheesecake. The slightly sour but sweet flavour of strawberries doesn’t inundate your mouth with unnecessary sweetness. All in all, it’s a pleasant, sweet combination of strawberry against the setting of cheesecake and with the added pleasure of almonds. Ingredients: Protein Blend (Milk Protein Isolate, Whey Protein Isolate), Soluble Corn Fiber (Prebiotic Fiber), Almonds, Erythritol, Water, Natural Flavours, Palm Oil, Sea Salt, Citric Acid, Steviol Glycosides (Stevia). Lemon Cream Pie tastes much like most lemon-flavoured products--sweet, but slightly tart. It’s both a delight and refreshment. You can enjoy it at the gym or as a quick snack to ward off binging. The creamy flavour checks the taste of lemon and makes the bar a finely balanced, smooth delight to have at any time in the day. The best thing about the lemon cream pie bar is that it doesn’t have the overly strong flavour of lemon. It stops beautifully short of the point where it gets excessively tart. The ideal balance of texture and flavour of the Lemon Cream Pie bar from Quest make it the ideal supplement for muscle growth and repair. Ingredients: Protein Blend (Milk Protein Isolate, Whey Protein Isolate), Soluble Corn Fiber (Prebiotic Fiber), Almonds, Water, Natural Flavours, Erythritol, Palm Oil, Dried Blueberries, Dried Strawberries, Sea Salt, Calcium Carbonate, Sucralose, Malic Acid, Citric Acid, Steviol Glycosides (Stevia). Quest’s Mixed Berry is different from others. It’s not like a dessert—it’s far from it. It’s exactly what it sounds like: a rich assortment of berries. Expect to sense a range of tastes when you let the mixed berry bar come in contact with your taste buds. You will sense the taste of juicy, luscious strawberries and of blueberries. But you should know something: mixed berries is not like chocolate brownie. If you are the type who loves juicy candies, and you don’t think your grown-up status is threatened by their presence in your mouth, you’ll probably like them. Like all other Quest Bar’s, the protein your body will absorb from a Mixed Berry bar will go a long way in reducing cravings for sugars and carbohydrates when your blood sugar gets low. It’s the perfect supplement to any diet. All famous chocolate brands have tried it, and (surprisingly) there is quite a large number of people who simply love the combination of mint with chocolate. Quest’s Chocolate Mint bars are meant for exactly this class of chocolate-mint lovers. If you like After Eight's, you will love Quest’s Mint Chocolate Chip bar. Again, it’s Quest- which means all the pleasure and delight of chocolate but without the fattening carbohydrates. The protein packed supplement will satisfy your hunger and slow down digestion. With Quest bars, you won’t be just satisfying your craving for mint chocolates; you also will be building muscles alongside. Ingredients: Protein Blend (Milk Protein Isolate, Whey Protein Isolate), Soluble Corn Fiber (Prebiotic Fiber), Almonds, Water, Erythritol, Dried Coconut, Natural Flavours, Cashews, Palm Oil, Sea Salt, Steviol Glycosides (Stevia). The coconut cashew is a unique combination of coconut and cashew. 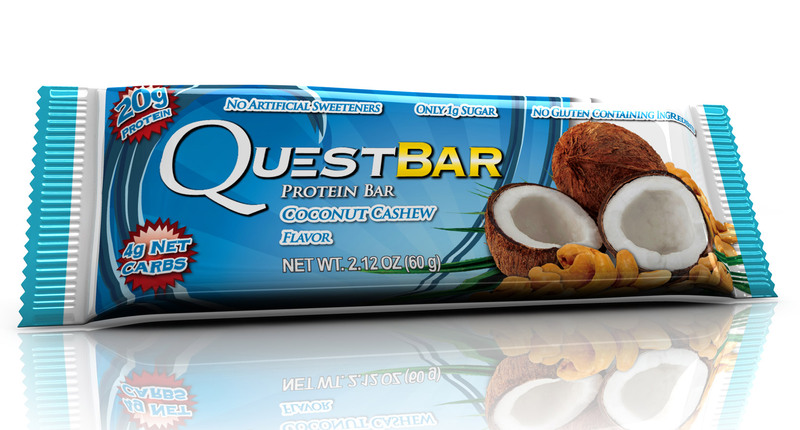 Like all other Quest bars, the beauty of coconut cashew lies in its carefully balanced strength of flavour. Unlike many coconut products, it’s not overly sweet or an unchecked build-up of flavour. The coconut flavour has been carefully used, not letting it reduce the protein bar to a cloying, second-rate sweet. The cashew introduces a whole different taste against the backdrop of coconut. Put simply, it’s more of an experiment by Quest. You should try as a means of supplementing your protein intake. It has its own fan club, and you might discover yourself to be one of them. Ingredients: Protein Blend (Milk Protein Isolate, Whey Protein Isolate), Soluble Corn Fiber (Prebiotic Fiber), Almonds, Water, Erythritol, Natural Flavours, Palm Oil, Sea Salt, Cinnamon, Calcium Carbonate, Steviol Glycosides (Stevia). Cinnamon roll is for the lovers of cinnamon bakery goods. Many people adore cinnamon. And, some love it more than anything else. 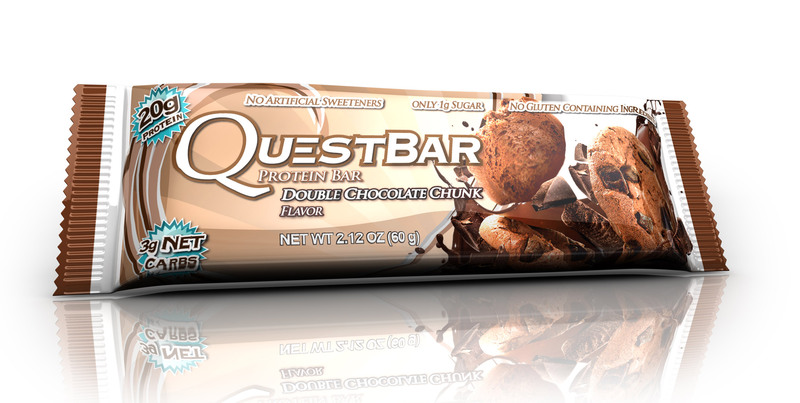 If you need a protein-rich diet, Quest’s Cinnamon Roll bar is quintessential for all your needs. Developed to taste great while providing you with the necessary protein to build muscle and reduce fat, Quest’s Cinnamon Roll bar is the perfect choice. Unlike other bars, the flavour of the Cinnamon Roll bar is fairly strong—meant to satisfy those cinnamon lover’s taste buds. You can sense a ton of cinnamon fragrance in every single bite, and it’s sticky, which mimics the texture of sticky cinnamon rolls. Surely, it’s delicious for some, and it’s an ideal supplement for a diet looking to increase protein intake. Ingredients: Protein Blend (Milk Protein Isolate, Whey Protein Isolate), Soluble Corn Fiber (Prebiotic Fiber), Almonds, Water, Erythritol, Natural Flavours, Walnuts, Dried Bananas, Palm Oil, Sea Salt, Calcium Carbonate, Steviol Glycosides (Stevia), Cinnamon. This one is delicious. It tastes exactly like a banana muffin with nuts in it--not at all different. Go to any quality bakery, buy a banana muffin with nuts in it, and you have the Quest Banana Nut Muffin--except for one thing: it would be a goldmine of disaccharides and polysaccharides, carbohydrates that make you fat. The Quest Banana Nut Muffin, on the other hand, is going to give you the much-needed proteins for muscle build-up. The best thing about these is you can have these with tea; you can take them in lunch or share these with a friend. They are the ideal protein provider coupled with taste. Ingredients: Protein Blend (Milk Protein Isolate, Whey Protein Isolate),Soluble Corn Fiber (Prebiotic Fiber), Almonds, Water, Unsweetened Chocolate, Natural Flavours, Erythritol, Cocoa Butter, Palm Oil, Sea Salt, Calcium Carbonate, Sucralose, Steviol Glycosides (Stevia). If there’s anything in the entire world which could beat the chocolate brownie, it would be the chocolate chip cookie dough. 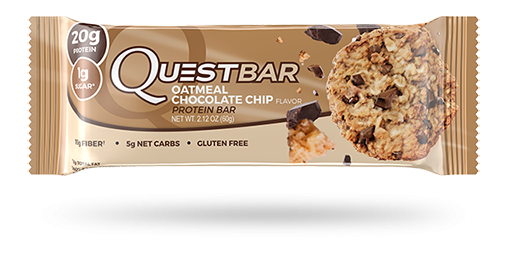 Quest’s protein bar featuring chocolate chip cookie dough is chocolate chip cookie dough at its very best. Tasting heavenly, these protein packed treats melt in your mouth. Instead of cocoa powder or cocoa butter, Quest Chocolate Chip Cookie Dough bars have real chocolate chips. These are meant for you if you are a chocolate-lover and want to feel the ultimate pleasure of chocolate chip cookie dough melting in your mouth without putting your health at risk. The protein packed supplement will supply your body with the energy it needs to keep you active and help you burn fat. Ingredients: Protein Blend (Whey Protein Isolate, Milk Protein Isolate), Peanut Butter, Unsweetened Chocolate, Cocoa Butter, Erythritol, Peanuts. Contains less than 2% of the following: Salt, Stevia, Sunflower Lecithin and Sucralose. 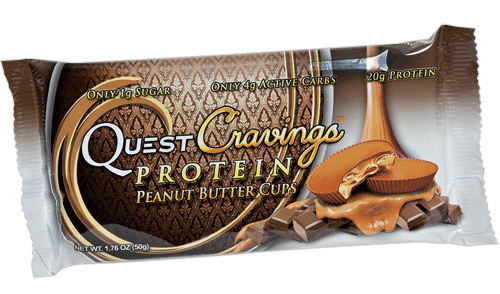 Quest’s Craving Peanut Butter Cup bars are made of peanut butter coated in moderately sweet chocolate, but without compromising on the nutritious value of proteins. The peanut butter inside is dry and crisp. The absence of sweetness in peanut butter is compensated by the outer chocolate coating. A one-line description of the Craving Peanut Butter Cups would be that these are crispy, nut-flavoured bars with chocolate adding sweetness to them. The best part again: these contain no soy, sugar or any other additives which can affect your health. And the chocolate in these is also absolutely healthful. It’s pure and non-Dutch processed, which means you can eat as many bars as you like without worrying a bit about the fat in your body. Ingredients: Protein Blend (Milk Protein Isolate, Whey Protein Isolate), Soluble Corn Fiber (Prebiotic Fiber), Peanuts, Almonds, Water, Natural Flavours, Erythritol, Palm Oil, Sea Salt, Calcium Carbonate, Sucralose, Steviol Glycosides (Stevia). The best way to describe PB & J (as these are famously known) is that it is another experiment by Quest. They have tried to produced something that retains the nutty taste of peanut butter, the slight taste of salt and butter in it by giving it a treat of jelly. Now, not everybody is a fan of jelly. For those who don’t like jelly, it might be best to try another flavour. But if you like both jelly and peanut butter, it’s for you. Keep these in the refrigerator for a few hours and then try them; you’ll have the most delicious peanut butter and jelly combination ever. Ingredients: Protein Blend (Milk Protein Isolate, Whey Protein Isolate), Soluble Corn Fiber (Prebiotic Fiber), Almonds, Water, Cocoa Butter, Natural Flavours, Erythritol, Palm Oil, Dextrin, Cocoa (Processed with Alkali), Sea Salt, Calcium Carbonate, Sunflower Lecithin, Sucralose, Coconut Oil, Xanthan Gum, Baking Soda, Steviol Glycosides (Stevia). Cream sandwiched between two delicious cookies is a treat adored across the globe, and Quest has found a way to make it nutritious. Tasting much like an Oreo, Quest’s Cookies and Cream bar brings the same delight but without all the sugar and additives. Where it beats other protein bar brands is in its almost-identical Oreo-like taste. Many other brands have also introduced similar cookies and cream flavours, but they couldn’t quite make these taste like Oreo, thanks to the limitation on their ingredients. For this reason, Cookies and Cream is a tremendous feat accomplished by Quest. They have been able to produce almost the same taste without stepping out of the parameters set for any top-quality proteins-bar brand. Add to the taste the muscle building and fat burning benefits of a protein supplement, and it’s the ideal snack. Ingredients: Protein Blend (Milk Protein Isolate, Whey Protein Isolate), Soluble Corn Fiber (Prebiotic Fiber), Almonds, Water, Erythritol, Unsweetened Chocolate, Natural Flavours, Palm Oil, Cocoa Butter, Sea Salt, Calcium Carbonate, Sucralose, Cinnamon, Baking Soda, Steviol Glycosides (Stevia), Cellulose Gum, Xanthan Gum. S’ Mores is nothing but Quest’s baking at its very best. Its chocked full of Quest’s delicious chocolate and equally delicious marshmallow and crisp cracker pieces, producing the ultimate melt-in-your-mouth product. This completely gluten free protein supplement snack is the optimal choice for anyone looking to fight off cravings. The protein packed treat slows down digestion, which leaves the body feeling full much longer. A fuller stomach means less cravings for the sugars and carbohydrates that inhibits creating lean muscle. Quest’s S’Mores, will leaving you refusing junk food and feeling fuller and healthier. It’s as good as it gets. Actually, it’s the zenith. It’s chocolate doubled, and it’s called Quest Chocolate Chunk. The simplest way to put it is that it’s the same delicious taste of Quest chocolate but in “double” the amount. And this twice as much chocolate does something even more delicious: it waters down the taste of proteins to make you feel nothing but the absolute pleasure of chocolate. There are people who like the taste of proteins. If you are one of those, the double chocolate chunk is not for you. But if you are one of those die-hard chocolate-lovers, Quest made it for you. Ingredients: Protein blend (milk protein isolate, whey protein isolate), soluble corn fiber (prebiotic fiber), palm oil, almonds, water, erythritol, pecans, natural flavours, pumpkin powder, sea salt, butter, sunflower lecithin, baking soda, sucralose, annatto extract (color), xanthan gum, cinnamon, steviol glycosides (stevia). A limited edition and Quest’s first ever coated protein bars, the Pumpkin Pies are surprisingly delicious with a thick coating of graham cracker. You have to work through this thick coating and pumpkin orange icing to reach the core, which consummates their one delicious bite. Talking of taste, these fall somewhere between vanilla and cinnamon. Actually, it’s a combination of the two without letting any one of them eclipse the taste of the other. These are deliciously crunchy and chewy and stand out in all bars because of their unique thick coating. Perfect for supplementing your protein intake to help build lean muscle mass, Quest’s Pumpkin Pie bars are a great tasting snack. This is a bar that has divided the people more than all others. Some love it; others absolutely despise it. Quest has produced it by bringing together a unique combination of almonds, raspberries, and chocolate. Not everybody has welcomed it. There are people who consider any innovation to chocolate as a heretic adulteration to their most sacrosanct blessing. They would never accept anything other than nuts in their chocolate. If you are one of these people, you won’t like the white chocolate raspberry bars either. But if you are from the camp which loves to experiment with chocolate and try it in as many foods and ways as possible, you might actually find it a lovely combination here. You might even get addicted to it. Either way, choosing to try the Quest’s White Chocolate Raspberry bar will fill your body with the necessary amount of protein to fight off cravings all while working to build muscle mass. Ingredients: Protein Blend (Milk Protein Isolate, Whey Protein Isolate), Soluble Corn Fiber (Prebiotic Fiber), Almonds, Water, Pecans, Gluten­Free Oats, Unsweetened Chocolate, Erythritol, Natural Flavours, Cocoa Butter, Sea Salt, Cinnamon, Sucralose, Steviol Glycosides (Stevia). One of three new flavours from Quest, this bar is likely to be enjoyed by those who prefer a tasty bar of a more conservative persuasion, as while it may be new, we wouldn't say it's groundbreaking, particularly given that it comes from a brand that has produced pumpkin pie flavour bars in the past. That being said, it is delicious, with a satisfying oatmeal flavour and texture all the way through and a touch of cinnamon bringing a hint of warmth and sweetness. Meanwhile, the occasional chocolate chip imparts a small element of surprise to this enjoyable but otherwise relatively unremarkable bar, which is essentially their Chocolate Chip Cookie Dough and the Cinnamon Roll bars rolled into one. If you're looking for a staple protein bar that tastes like a real cookie and has a pleasingly gritty texture to get your teeth around, you won't be disappointed with the Quest Oatmeal Chocolate Chip bar. If you're looking for a new taste sensation on the other hand, you might want to try one of their other bars, such as the new blueberry muffin flavour (below). Whichever one you settle on, you can enjoy it with an element of smugness, knowing that while you're munching on your chosen bar you're supporting your body's natural muscle building and recovery processes. Another new flavour to hit the shelves, the blueberry muffin Quest bar has managed surpass the huge amount of hype surrounding it and attracted a great deal of positive feedback, even garnering pleasant surprise from those who tend to avoid fruity bars (perhaps having tried one of the more unique contenders above). The taste, smell and texture are uncanny, with pieces of dried blueberry and generous chunks of what feels like real muffin, and a genuine blueberry muffin flavour that begins with a subtle sweetness and develops into a punchier, more full-on flavour as you chew. Whether you're a fan of fruity protein bars or you just really WANT to like them, we certainly wouldn't hesitate to recommend this pleasing offering. Who knows, you might just become a convert. And all the while you'll have the added bonus of knowing that by eating Quest’s Blueberry Muffin bar, you're supporting your body's protein needs. Ingredients: Protein Blend (Milk Protein Isolate, Whey Protein Isolate), Soluble Corn Fiber (Prebiotic Fiber), Almonds, Water, Cocoa Butter, Cocoa (Processed with Alkali), Natural Flavours, Erythritol, Sea Salt, Sucralose, Steviol Glycosides (Stevia). The latest Quest bar has been one of the most eagerly anticipated of all time and it’s easy to see why. Who would pass up the opportunity to gorge guilt-free on the contrasting tastes and textures of bitter-sweet chocolate, crunchy almonds and squishy marshmallows? Not me, I thought as I greedily unravelled their latest offering. So why hasn’t it got my 10/10? After all, the chocolate foundation is good - similar to that of their other bars and middling in terms of sweetness - and the almond chunks combine effectively with the cocoa to create a satisfying chocolate nut bar. But alas, therein lies the problem, because what lets the Rocky Road Quest Bar down is the somewhat overpowering taste of almond and, moreover, the absence of the taste or texture of marshmallow. However, if you're a fan of chocolate-nut combos I’m sure you will still appreciate this bar for what it is – and, it goes without saying, for the benefits it offers in supporting muscle growth and maintenance. Ingredients: Protein Blend (Milk Protein Isolate, Whey Protein Isolate), Soluble Corn Fiber, Water, Almonds, Erythritol, Natural Flavors, Palm Kernel Oil. Contains Less Than 2% of the following: Butter (Cream, Salt), Salt, Baking Soda, Sodium Caseinate, Xanthan Gum, Steviol Glycosides (Stevia), Sunflower Lecithin, Honey*. * Adds Trivial Amount Of Sugars. This is the bar that promises you all the taste, texture and satisfaction of a morning waffle. Imagine sitting in the sun on a balcony, with a coffee in hand and a stack of waffles, drizzled in maple syrup. Well Quest can’t give you the sun, coffee or morning bliss, but they can give you the taste of Maple Waffle in this uniquely flavoured protein bar. It gets 7/10 on the texture and the taste is nearly there. The only thing extra that Quest could have done would be to add some more sweetener in it, and maybe even some real waffle pieces to give the palate a different texture to play with. And all the while you'll have the added bonus of knowing that by eating Quest’s Maple Waffle bar, you're supporting your body's protein needs. Ingredients: Protein Blend (Milk Protein Isolate, Whey Protein Isolate), Soluble Corn Fibre, Peanuts, Water, Erythritol, Almonds, Peanut Flour, Natural Flavours, Cocoa (Processed with alkali), Contains less than 2%: Unsweetened Chocolate, Cocoa Butter, Sea Salt, Sodium Caseinate, Monk Fruit Extract, Steviol Glycosides (Stevia), Sunflower Lecithin. The latest Quest bar has been one of the most eagerly anticipated of all time and it’s easy to see why. The combination of brownies and peanut butter, in a bar that is healthy for you and packed full of protein?! Who knew that could be possible. Who would pass up the opportunity to gorge guilt-free on the contrasting tastes and textures of bitter-sweet chocolate, chewy brownies and delectable peanut butter? The only way you don’t like this bar is if you are aren’t a fan of peanut butter? But we are pretty sure everyone is a fan of peanut butter, unless you are allergic to peanuts. The Peanut Butter Brownie smash quest bar has finally been unveiled, and it is definitely one of the flavours that we will continue to buy (and eat). It’s half chocolate chip cookie, half chunky brownie, but all mashed together! To make it a 10/10 for us, we microwaved it (out of the wrapper) for two seconds to increase the gooey goodness of the bar! Ingredients: Protein Blend, (Milk Protein Isolate, Whey Protein Isolate), Soluble Corn Fibre, Almonds, Water, Erythritol, Natural Flavours, Unsweetened Chocolate, Cocoa Butter. Contains less than 2% of the following: Cocoa processed with Alkali, Coconut Oil, Sea Salt, Baking Soda, Steviol Glycosides (Stevia), Xanthan Gum, Sunflower Lecithin. We are pretty sure that most people would love to start their days with a cup of coffee and a few cookies. But that’s not the healthiest way to start your day is it? So Quest did all the hard work for us, and created this healthy protein bar. The mocha chocolate chip is coffee flavoured, with cookie crumbles and chocolate chunks throughout the bar. A craveable, caffeine-free Mocha bar is a chocolate coffee lover’s dream. With 20g protein per bar, 4g of net carbs (with only 1g of sugar) this should be the perfect bar to replace those mid-day cookie fixes. But why only 6/10 then? The coffee taste in the protein bar is quite a bitter flavour, and combining that with a more dark chocolate coating has left us being a bit parched after the bar. It would have been great to use a lower cocoa chocolate coating, or extra sweeteners to lift the bar a little bit more. Add in some extra choc chips and the bar will be perfect then. So personally we would like a little less bitter punch, and a little more sweet delight for this bar. Go Quest bars, it’s your birthday. Well it’s someone’s birthday in the world right? Celebrate with the Quest Birthday Cake bar. It’s said that birthday cake calories don’t’ count when it is your birthday, but you don’t have to worry about calories with the Birthday Cake flavoured bar. The low calorie and low carbohydrate bar means you can enjoy the flavour of birthday cake, without the extra sugar. The taste and texture of this bar is bang on and it actually feels like you are being naughty and eating cake, so just close your eyes and eat the bar, totally guilt free. It’s a sweet vanilla centre, coated in lush white chocolate and vanilla coating with all natural and sugar free sprinkles! This is definitely one of the sweetest protein bars that Quest Nutrition have brought, but definitely “going straight in my basket”. The newest product from the Quest Nutrition line, and one which we are probably the most excited for! It promised to be the most amazing flavour and the perfect texture profile, and this one totally delivers. Once again Quest have wowed us with this unbeatable flavour. A protein bar coated in milk chocolate, topped with sprinkles with a soft, squishy doughnut-like cake centre. Upon the first bite you get a lovely milk flavour followed by the aftertaste of dark chocolate. This dual flavour paves the way for the sweetness enhanced with the chocolate sprinkles that coat the bar. Whilst there is no typical buttery, pastry like feeling of a normal doughnut, close your eyes and you still get the same flavour. After all, we are all about flavour! The texture comes as no surprise, being a soft consistency, fooling the taste buds into thinking that you are eating a doughnut – just a healthier one at that. When you factor in flavour, and factor in good calories for less than 200 calories a bar it's a delicious investment; your pocket and stomach will thank you for it. Ingredients: Protein blend (milk protein isolate, whey protein isolate), soluble corn fiber, almonds, water, hazelnuts, erythritol, natural flavors. Contains less than 2% of the following: cocoa processed with alkali, unsweetened chocolate, cocoa butter, sea salt, sodium caseinate, steviol glycosides (stevia), sunflower lecithin. You can go nuts over this bar. Or go hazelnuts! This protein bar has been the one flavour that Quest just haven’t made, until now. Prepare for the ultimate hazelnut protein bar, probably the best one in our opinion. It’s a fusion of chocolate chunks and WHOLE hazelnuts, not just pieces all squashed up. There is a perfect nutty crunch with a soft and not subtle taste of creamy Hazelnut. We are very impressed by the soft texture and fresh feel to the bar. You get an almost nougat feeling, with the crunch of the whole hazelnuts and then SNAP. You taste the chocolate chunks which are super moreish and chocolately with a crisp texture. What’s the first thing that pops into your head when you think of a combination of chocolate and hazelnuts? Well we think of Nutella. Now sadly, the Hazelnut Quest bar doesn’t taste of nutella, but it does have a nice taste of chocolate and a taste of Hazelnut. So we can’t complain there. It does what it says on the tin. It certainly makes for a one off treat, but we would probably buy a mixed box of this and other flavours to keep the taste buds entertained! Like our article? Let us know on Facebook and be sure to check out our other articles for more great reads!